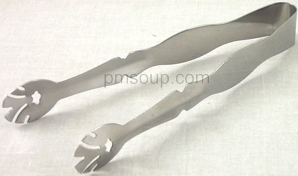 Our Stainless Steel Fruit Tongs are sure to dress up any table. Tongs are an easy and sanitary way for guests to use at dinner parties or for appetizers. These tongs have a super grip feature as well as a hole for easy draining. It's also a great ice tongs.